Create your own custom wire shelving with the Amco Wire 4-shelf unit. 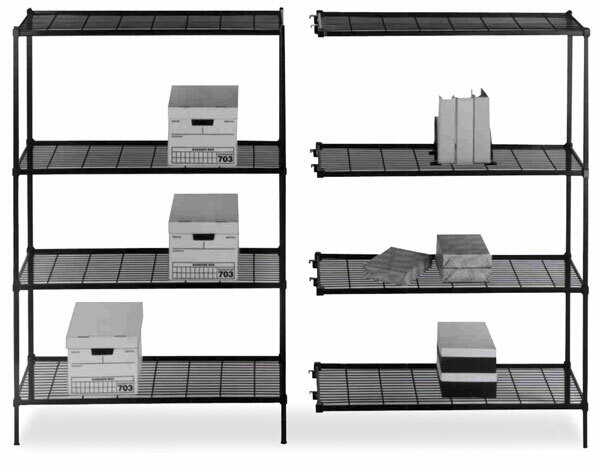 Amco wire shelves support on average 600 lbs each, which is 3½ times the weight of sheet metal shelves. They provide greater visibility and light penetration, are virtually dust-free, require no maintenance, and are relatively inexpensive. Shelves adjust on 1" centers. Black epoxy coated. Assembly is required. Choose from two shelf widths. The starter set includes four shelves and four posts. Begin with the starter unit and purchase the Add-On Unit to economically expand your storage needs. Add-ons eliminate the barrier of a post when turning corners at 90º. 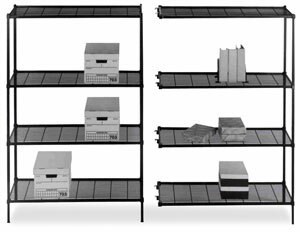 Each set includes four shelves, two posts and eight add-on clips.